(Bellevue, NE) -- An Omaha-area park is continuing to be impacted by flooding. Officials say Haworth Park has closed its camping sites and removed boat docks in the aftermath of last month's floods. In addition, standing water remains over some of the park's walking trails, playground and picnic areas. OMAHA, Neb. (AP) — An overnight storm dropped more than 5 inches of rain on eastern Nebraska and western Iowa, causing street flooding and forcing some schools to close for the day. DEWITT, Neb. (AP) — Governor Pete Ricketts has declared a state of emergency in areas of Nebraska affected by tornadoes and flooding. OMAHA, Neb. (AP) — Nebraska cities along the Missouri River are still waiting for nearly $7.2 million to be reimbursed from state and federal agencies, more than 3 years after a 2011 flood. OMAHA, Neb. (AP) — The list of landowners suing the federal government over major flooding along the Missouri River since 2006 has grown considerably. OMAHA, Neb. (AP) — The federal government says the U.S. Army Corps of Engineers shouldn't be blamed for causing major flooding along the Missouri River. OMAHA, Neb. (AP) — Omaha Public Power District officials say it will reduce power as it prepares for rising water on the Missouri River. A Flood Warning is in effect along the Missouri River. A new smartphone app can alert you when there’s flooding in your area. COUNCIL BLUFFS, Iowa (AP) — Council Bluffs officials took a step toward improving the city's levee system by hiring an engineering firm to oversee the effort. OMAHA, Neb. (AP) — A group of farmers and business owners is suing the U.S. Army Corps of Engineers, claiming the agency mismanaged the Missouri River since 2006 and contributed to major flooding in five states. LINCOLN, Neb. (AP) — A hydrologist says local flooding remains a threat along the Platte River in Nebraska. The Platte River is expected to rise in eastern Nebraska over the next few days as floodwater from Colorado reaches the area. NORTH PLATTE, Neb. (AP) — The flooding along the South Platte River continues to set records in western Nebraska, but the defenses communities built are generally holding and the floodwater is slowly flowing east across the state. BIG SPRINGS, Neb. (AP) — The South Platte River looked like a trickle in Western Nebraska before the Colorado floodwaters began to arrive. NORTH PLATTE, Neb. (AP) — Nebraskans are bracing for flooding along the South Platte River later this week when the water from Colorado's torrential rains arrives. American Red Cross volunteers from the Nebraska/Southwest Iowa region are heading to Colorado following deadly flooding there. DES MOINES, Iowa (AP) — Two new websites are offering support to Iowa residents in areas hit by recent storms and flooding. The U.S. Army Corps of Engineers says drought conservation measures will remain in place along the Missouri River basin. KANSAS CITY, Mo. (AP) — More than $180 million worth of repairs to Missouri River levees battered by the historic 2011 flooding are winding down. But critics complain the work is taking too long to complete. More than a year after severe flooding devastated areas along the Missouri River, repairs to Omaha’s levee system are nearly complete. Last summer at this time, Nebraska and Iowa were in the grips of major flooding along the Missouri River. Now, a small southwest Iowa community hopes to make permanent a levee that protected them from the river. Omaha Public Radio's Deborah Newcombe takes us there. More information about Hamburg's efforts is available at www.hamburglevee.com. The Omaha District of the U-S Army Corps of Engineers estimates it'll cost 280-million dollars to repair all the damage caused by last year's flooding will cost 280-million dollars. U.S. Army Corps of Engineers officials say more than $100 million dollars worth of levee repair work has been done following last year’s Missouri River flooding. 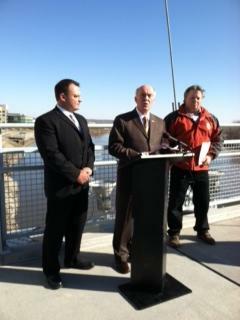 Omaha and Kansas City District officials updated the post-flood repairs during a conference call Friday. 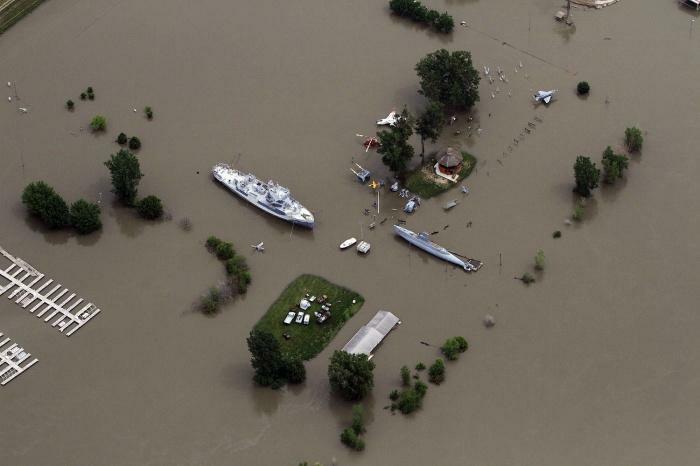 Last summer’s flooding along the Missouri River caused significant damage in Nebraska and Iowa. The U.S. Army Corps of Engineers hopes to have all Missouri River levee repair projects complete by the end of this year. Corps officials updated the status of levee repairs during a conference call Tuesday. 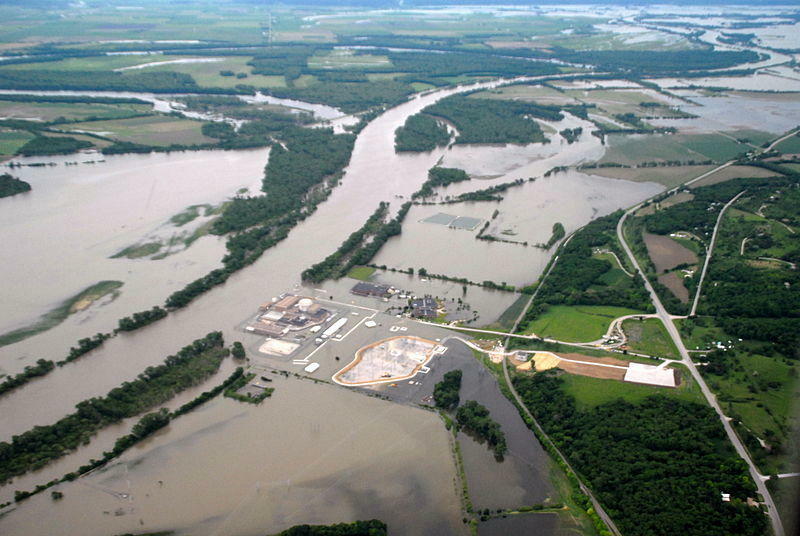 Last summer’s Missouri River flooding caused significant damage in Nebraska and western Iowa. 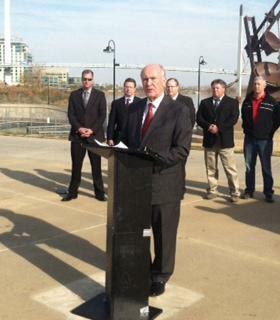 The Corps’ Omaha District has 11 levee repair projects underway, with $99 million dollars in repairs complete. The U.S. Army Corps of Engineers plans to build a new, three-mile long levee near Nebraska City. The $12.9 million project will re-align levee L-575 along Highway 2. It’ll be built further away from the Missouri River than the existing section of levee. Once it’s built, the existing levee at that location in Fremont County, Iowa, will be torn down. 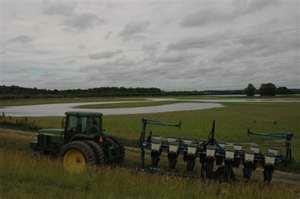 The Corps of Engineers awarded a contract earlier this week for the levee setback project. The Papio-Missouri River Natural Resources District is contributing $2 million toward additional upgrades and a study of Omaha’s levee system. The study is required for FEMA recertification of the levee system. That’s separate from what’s done by the U.S. Army Corps of Engineers. FEMA began requiring levee certifications after Hurricane Katrina. The 2012 spring runoff season is underway along the Missouri River. U.S. Army Corps of Engineers officials say releases from Gavins Point Dam averaged 22,000 cubic feet per second during February. It’ll stay at that level through the middle of this month, and then increase for the start of the navigation season. Last year’s record runoff season led to devastating flooding along the Missouri River in Nebraska and Iowa. The leader of the Corps of Engineers’ Omaha District believes the agency is better prepared in the event of flooding this year. About 70 emergency managers and levee sponsors gathered Tuesday in Omaha for the annual Missouri River flood fight preparedness training. Last year’s Missouri River flooding inundated farms, businesses, and homes in western Iowa for more than three months. Western Iowa residents forced out of their homes by Missouri River flooding may have another option for temporary housing. Iowa Finance Authority spokeswoman Ashley Jared says flood victims can apply for a waiver to live in housing usually restricted by the federal government to low-income families. Jared says the waiver applies to flood victims in Monona, Harrison, Pottawattamie, Mills, and Fremont counties. People who lived in those counties between May 25th and August first of 2011 can apply for the housing waiver.